His grandfather is dying. He says “There’s no time. Find the bird. In the loop. On the other side of the old man’s grave. September third, 1940. Emerson – the letter. Tell them what happened, Yakob.” This is the beginning of a terrifically weird adventure for the ill-adjusted fifteen-year old, Jacob. For months after Jacob finds his grandfather dying in the woods behind his house, he has nightmares. His parents send him to a psychiatrist who gives him pills. But Jacob begins to understand that his horrible visions and his grandfather’s mysterious last words aren’t just a psychotic fantasy. He and his father travel to Wales, where Jacob manages to find Miss Peregrine’s house and the peculiar children. The “peculiars” are kids with special talents like super-human strength, the ability to levitate, and invisibility, and they’re in great danger from a group of peculiars who have been transformed into monsters by an experiment gone horribly wrong. By the end of the book, it’s up to Jacob to rescue his new friends. 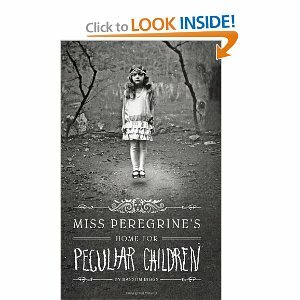 Rigg’s strange story is accompanied by antique photographs, pictures of the peculiar children and Miss Peregrine. These stories add to the delightfully weird ambience of the narrative, as the photographs are black and white and grainy. The book is spooky and violent, and the adults don’t behave very well and – it goes almost without saying – don’t understand the teenage Jacob at all. The book is targeted at young adult readers, but it’s a treat for grown-ups who enjoy fringe fantasy adventures, too. There’s gory violence, gut wrenching monster attacks, and a final hair-raising chase scene. This recipe is certain to make the kiddies happy. Why should kids have all the fun and get books with pictures? Give this book as a Yule treat to a friend who loves this kind of story.